Welcome to my blog! This week has been fraught with dramas and problems with my blog, and thankfully I am now 'back on air' Before I share with you my creation for this weeks challenge I really must thank Libby Dyson for all her help in getting me back up and running when she is such a busy person with so much on her plate, but still made time to help me out. Thank you Libby! Onto this week's challenge which was created by our very own Vicky. The challenge was once again 2 part. 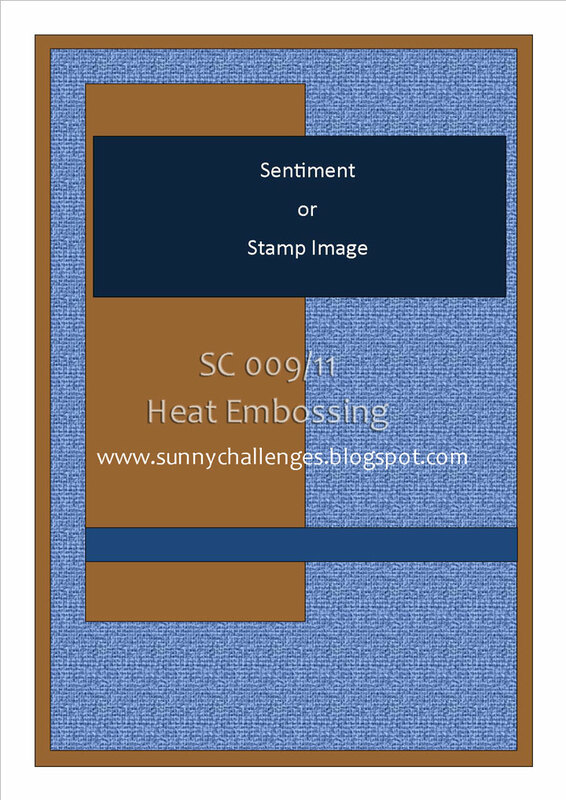 The first part of the challenge was the sketch and the second part of the challenge was for us to dust off our heat guns and get out the embossing powders and do some heat embossing on out creation. I had a trillion thought go through my mind on what I was going to do, tried a couple and didnt like them so it was back to the drawing board! My card base was Very Vanilla, and I topped that with a mat of Lucky Limeade which I then usedVersamark the new Stitched Stockings stamp set. 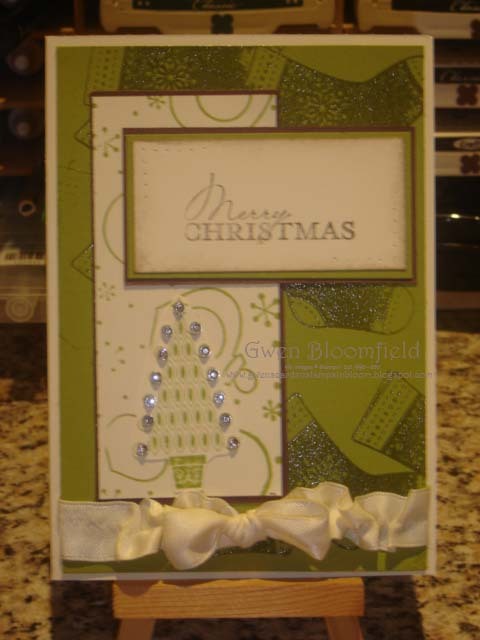 Clear embossing powder was sprinkled on top and then heated, so the base has embossed christmas stockings on it. I matted a strip of Very Vanilla that I has wheeled using the sparkle and Shine Jumbo Wheel and Lucky Limeade ink onto a piece of Choc Chip, and then stamped the tree from Contempo Christmas, cut around it and attached to that strip. I added basic rhinestones to the tips of each branch and also to the star on top of the tree. 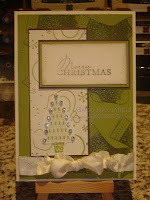 The sentiment from Contempo Christmas, I stamped using Choc Chip and also sponged the edges in the same colour. The ribbon I tied a bow then ruffled and attached to the bottom of the card using my trusty snail! I cant wait to see both Kris's and Vicky's creations, I am always in awe of what they do. So come along and play with us this week on Sunny Challenges and Creations and share your creation with us all! Gwen I love the way you have used all these gorgeous elements on this card. The tree is just gorgeous with all that bling. Really pretty.